There is something about indie films that makes me judge them with slightly a different eye than their big budget counterparts. Maybe it is because The Movie Mind is a budding indie filmmaker himself (ahem) and I give those who dare try something unique the benefit of the doubt, or maybe it is because I simply enjoy what these films stand for. I’m never going to go completely over to the dark-side and forsake the big studio films, mostly from my fear of having to start wearing corduroy jackets with jeans and little eye glasses with no prescriptions, but I will always be able to appreciate a good indie. 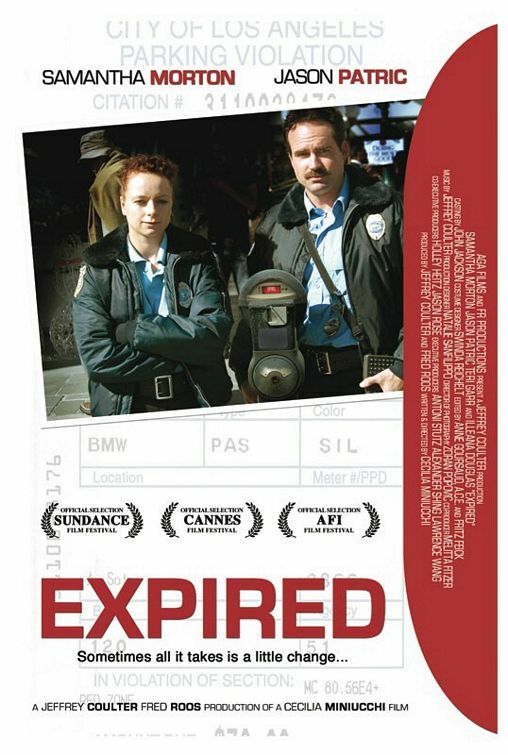 Simply put, Expired is a good indie film. Naturally, there are those elements of indie films that tend to drive me crazy when watching. I saw a decent number of editing errors, jump cuts, and continuity errors, and all were too easily noticeable. I’m not saying studio films don’t have those too, but it’s like indie films use their lack of budget as an excuse to get careless. As long as you can overlook those few lazy mistakes here and there, the overall look and feel of the film went along well with the tone of the film. We’re not really sure if it is supposed to be a comedy, but in the end we realize that it is more of a character portrayal that happens to have some funny moments. Samantha Morton is Claire, one of the rare parking enforcement agents (aka meter maids) with a polite disposition and sweet caring personality for others. She is content with her position in life, aside from not having a love interest. She cares for her sick mother, and seems to think that it is possible to do her job without being an a-hole to everyone she encounters. Jason Patric (Jay) does not have that same outlook. He feels that it is his duty to be an a-hole, as if he seeked out this job as a way of taking out his aggression on everyone that has wronged him in life. Somehow these two opposites attract, and their relationship is an amusing take on two people who need each other for two completely different reasons. Jason Patric is phenomenal in this role and somehow manages to get just a bit of our sympathy even though he seems to be the biggest d*ck in the world. While Samantha Morton also does a good job as what I thought was a “Pam Beasley-lite” character, she is still a little bit dry and could have done more with the role. What you get with Expired is a well-written, nicely acted indie film that will draw you in with a compelling relationship story. There are no special effects, no big budget flare, and you shouldn’t even notice because the film is done well. It is an excellent change of pace film that you should watch when you just need something different. It is comforting to know that no matter how much drivel Hollywood shovels down our throats, there will always be filmmakers who do it for the love of making good movies. Now that my public-service announcement has concluded, I’m off to watch a Die Hard/Lethal Weapon marathon. See, I’m just making sure you know it’s still me…The Movie Mind.